iOS is a mobile Operating System developed by Apple Inc. What makes iOS different from other Operating Systems is, "It's uniqueness in UI design and easy approach for memory management." iOS Programming is used mainly in the development of Apple Products like iPhone, iPad, Apple Watch, Apple Tv and Objective-C is the core language in iOS Programming. Objective-C is the first step to understand iPhone App Development. Before moving forward, I strongly recommend to go through our Objective-C tutorials and get the fundamentals of Objective-C clear. Let's begin with the fun iWorld Programming. There are two ways to design an iOS app. The first one is by using StoryBoard(Drag and Drop method) and the second one is programmatically which I strongly recommend. By Coding all the stuff, you may have a deeper knowledge of everything. 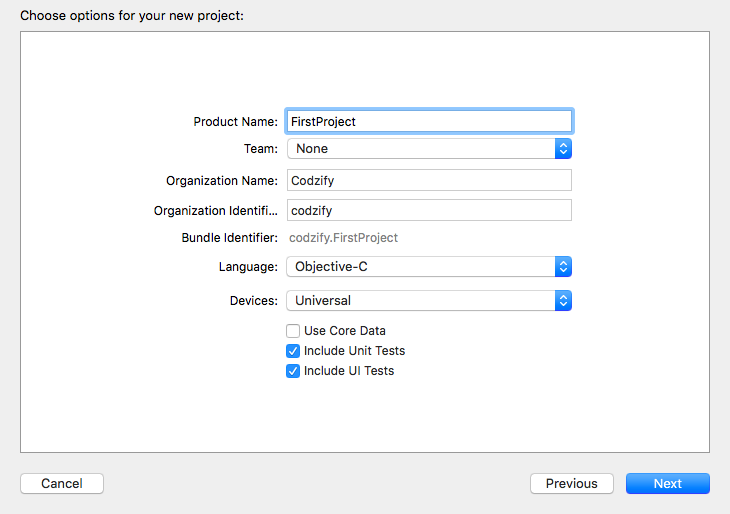 Open Xcode Goto File > New >Project >Single View Application > Enter Project Name (eg :- FirstProjectViewController) > Done. You can see two files on left navigation Menu of Xcode, ViewController.h and ViewController.m. These are the files automatically generated by Xcode when you create any new project. Now, you have everything to start creating your first iOS app.